6/9/2010: This entry was downloaded from my Art Diary on the Bellsouth Personal Web Pages. 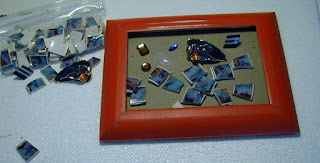 After completing, this picture frame was tucked away until 9/2008. When Lilly was born, I put a picture of her and her momma in it and presented it to Nikki. She keeps it on her bookcase. Selected next project .... a small picture frame that was picked up at a yard sale two weekends ago. (Need something small after spending so much time on the entry table). Removed glass, picture & backing from frame. Sanded lightly with hand sander. Selected glass, a couple pairs of contrasting earrings and some bangle type thingies. Painted back and side edges with three coats of gold acrylic paint. As glass selected is already cut, will begin process of nipping and deburring. Finished nipping/deburring. 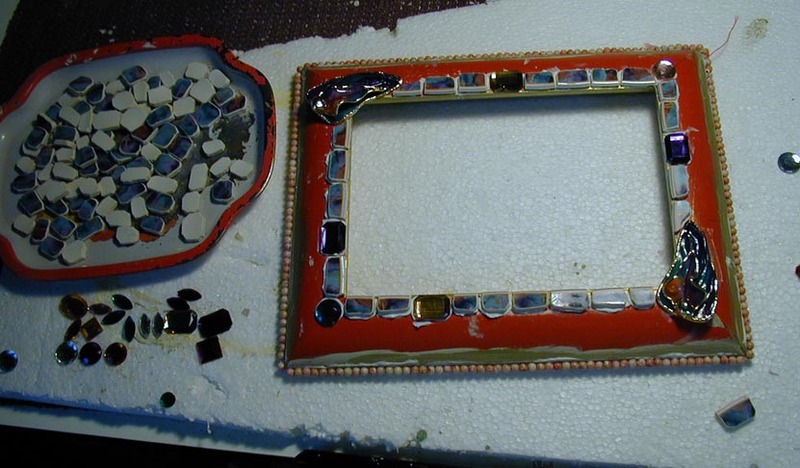 Started applying tesserae and jewelry to picture frame. Finished applying Tessarae to frame. Set aside to dry for several hours, and then cleaned with a damp cloth. (Usually lay a damp cloth over piece and allow moisture to loosen any mastic, then wipe off gently with a cloth. You have to be careful as it takes a couple days for mastic to firmly dry. Signed piece as 'Spring Jewel' (primary name of china used), signed and dated. Applied three coats of PolyAcrylic to back and outside/inside edges. Hold for next grouting session. a) Mixed small amount of white grout (on dry side) in mardis gras cup. Added small amount of lavender paint to tint grout. Mixed well. 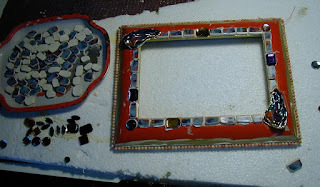 b) Applied grout to mirror frame with hands; pushing between spaces and around edges of jewelry and beads. 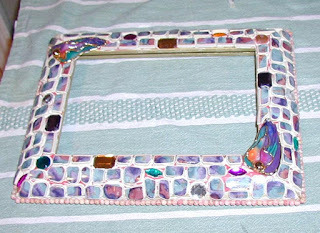 c) Remove grout with small sponge, rinsing sponge between each swipe of the frame. Goal is to remove grout from tops of glass and jewels, but not from between cracks. d) Keep working at removing grout until everything clean. Having jewelry on a piece always makes grouting more difficult. 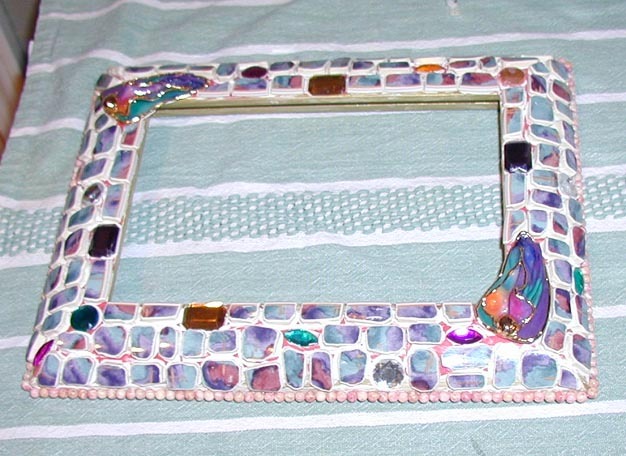 Invariably, grout gets into little spaces on the jewels and is quite difficult to get out. (This typically comes down to coaxing out with a toothpick). Will set aside for a hour or two and then buff a couple times to remove any haze that develops on the glass. This piece is named Spring Jewel. Tomorrow, or Monday if we go to the Wooden Boat Festival, I'll seal and then we can put together and finish. Applied two heavy coats of "Impregnator", a sealer, to the picture frame. Waited 10 minutes, then wiped excess liquid from glass so it does not form liquid spots. This piece is named Spring Jewel (after the primary glass used). It will be posted in the 'not for sale' section of the Mosaic Gallery. This piece will be a gift.